What does the crisis in Egypt mean for the Israeli-Palestinian peace process? Reuters Prime Minister Benjamin Netanyahu of Israel, left, and President Hosni Mubarak at a meeting in Sharm El Sheikh, Egypt, on Jan. 6. The uprising in Egypt has created turmoil for Israeli and Palestinian leaders, who have their own complicated relationships with the Mubarak regime. 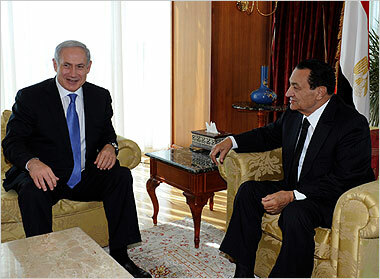 For Prime Minister Benjamin Netanyahu of Israel, President Hosni Mubarak has been his strongest ally in the region. At the same time, Mr. Mubarak has been a firm ally of the Palestinian Authority and a staunch supporter of the stalled Israeli-Palestinian peace process. Egypt has also tried to broker reconciliation talks (so far, unsuccessfully) between Fatah, the party governing the West Bank, and Hamas, which controls Gaza. Room for Debate: Where Will the Protests in Egypt Lead? What does the crisis in Egypt mean for the Israeli-Palestinian negotiations? How crucial is Mr. Mubarak to dialogue between Israel and its neighbors? Will change in the Egyptian regime make progress in Mideast peace talks even less likely? Gil Troy is professor of history at McGill University and a Shalom Hartman Research Fellow in Jerusalem. Egypt’s uprising has already undermined most Israelis’ sense of security and their willingness to take risks for peace with the Palestinians. Israelis now worry about the biggest risk they ever took for peace: the withdrawal from Sinai in 1982. Many Israelis wish they could support this popular move against Mubarak, but bitter experience has taught them to be skeptical. A radical Egypt downgrading or abrogating its peace treaty with Israel would top the litany of failed peace-making attempts and reinforce the argument of right-wing skeptics against trading land for peace with the Palestinians. Moreover, a hostile Egypt would reinforce the sense of betrayal so many Israelis have felt since 2000, as the failure of the Oslo peace process triggered a wave of Palestinian terror, the withdrawal from Lebanon boosted Hezbollah, and disengagement from Gaza brought Hamas to power. Israelis have longed for greater intimacy with the Egyptian people, always speaking of “peace with Egypt” not with Mubarak. Yet this “cold peace” has been government to government not people to people. Israelis have accepted the limits, given their alternatives. Mubarak’s Egypt has served as an important counterweight to Ahmadinejad’s Iran. The recent Wikileaks documents suggested some of the benefits Israel enjoyed from its alliance with Mubarak, including diplomatic support, intelligence sharing and military cooperation. Most important have been decades of non-belligerency. With the loss of that sense of security on its southern border, Israelis will be much more reluctant to cede control of their eastern border to an independent Palestine. This week’s hysterical headlines in the Israeli press about the potential loss of Egypt, the dip in Tel Aviv stocks, the debate about whether President Obama can be trusted to support American allies, all suggest that Israel’s strategic doctrine is being hastily rewritten. The prospects of peace become even more unlikely if Egypt turns Islamist. Israel’s safest border will suddenly look menacing. Hamas will look stronger in Gaza with an Islamist Egyptian regime not even pretending to try to stop the flow of arms. The Palestinian Authority in the West Bank will look like a less viable peace partner with fundamentalism ascendant, and any pro-peace or pro-Western Palestinians demonized as collaborators. Moreover, Israeli policymakers will feel caught, doubting Mahmoud Abbas as another unelected autocrat while fearing the popular Palestinian street more than ever. Israelis find themselves once again in dissonance with the international community. Many Israelis wish they could wholeheartedly support this popular move against an aging dictator. But the bitter experience of the last ten years suggests that skepticism is in order. Why did 400 rabbis attack Fox News’ Glenn Beck and defend George Soros?